SEWING/TEXTILE ARTS – The sewing/textile arts programs taught by the Creativity Shell are customized and structured based on the age, location and size of the class we are working with. Structured programs are designed to give confidence to the students. On the first day of class, students are usually able to finish a project and take it home. After the first month of instant gratification, students are weaned off simple projects and gradually begin receiving bigger and more complicated projects to work on. By the time the students are enrolled in their second month of our programs, their confidence in using the machine and making small items encourages them to have patience for larger more complicated items. S.T.E.A.M/SEWING – The Creativity Shell is also blending S.T.E.A.M (Science, Technology, Engineering, Art and Math) skills with our sewing/textile arts program by teaching students to sew with Electricity Conductive Threads (ECT). 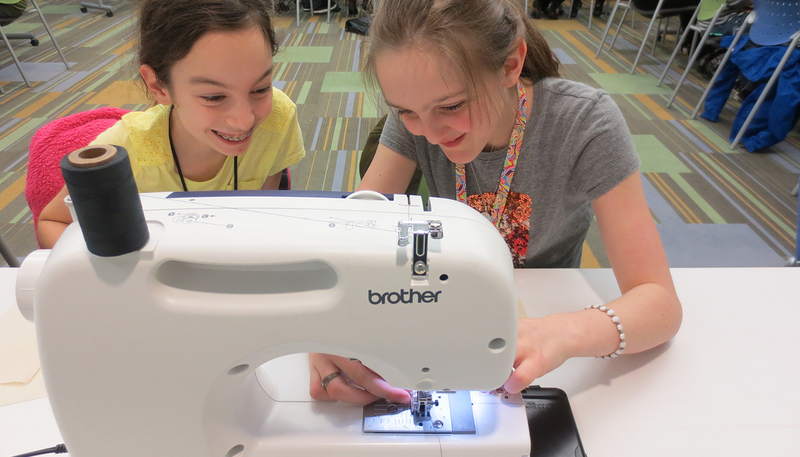 Students in these classes learn to use ECT to add electrical elements to their garments such as LED lights. Students will also learn to “CODE” the electrical elements of their garments and allow them to “Light Up” in sequence. In the future, some of our students plan to create clothing that can charge smart watches and other devices. SOAP/BATH BOMB MAKING – Students enrolled in soap/bath bomb making workshops can make their own bath bombs and bath soaps! Each student will usually make around 1-2 bath bombs and around 2-3 different types of soaps. Items can be used as gifts for friends or family members. Soaps and bath bombs can also be incorporated into birthday parties, Scout Troops or for team building events. 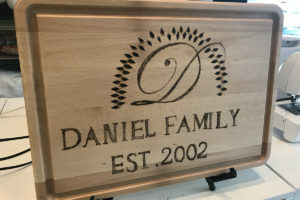 PYROGRAPHY (NEW) – Pyrography is the art of burning. In the Creativity Shell pyrography workshops, students learn to burn wood to create art. Students will learn to burn wood items such as cutting boards, wood plaques, wood necklaces and other wood items for decor or art. GLASS FUSING (NEW) – Glass fusing workshops at the Creativity Shell are a great way to recycle glass and create at the same time. Students enrolled in these Classes can make glass fused necklaces, bracelets, wall plaques, Minecraft swords, plates, bowls and unique art pieces. This is also a great class to teach students to cut class and build fine motor skills. 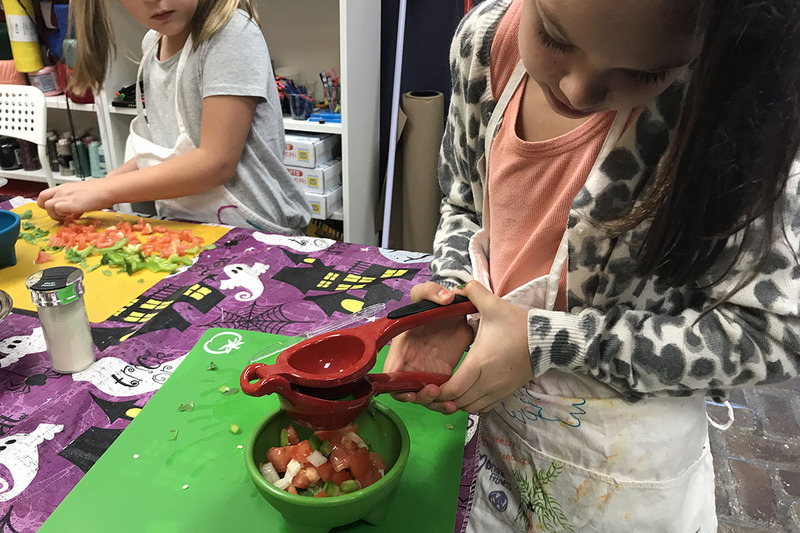 COOKING – Cooking classes at the Creativity Shell are designed to teach children to create with food! Students in this class learn about nutrition, they learn to cut food, prepare food, food safety, measure, bake and more! 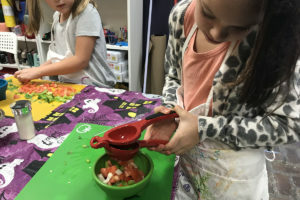 Cooking classes at the Creativity Shell are also designed to teach children to eat! Students in this class often prepare meals and eat together as a group. They are also encouraged to clean up after themselves and dispose of food in a safe manner. 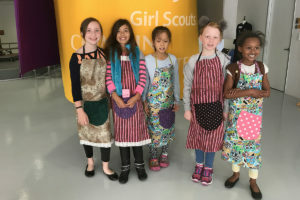 GIRL SCOUTS BADGES – The San Jacinto Girl Scouts has partnered with the Creativity Shell, to offer specialized sewing/textile arts workshops for Houston Girl Scouts! Girl Scouts attending the sewing/textile arts workshops will learn sewing/textile arts skills taught by textile professionals employed by the Creativity Shell. Students will learn machine-sewing skills, vocational fashion skills such as up cycling as well as textile arts such as fabric dyeing. 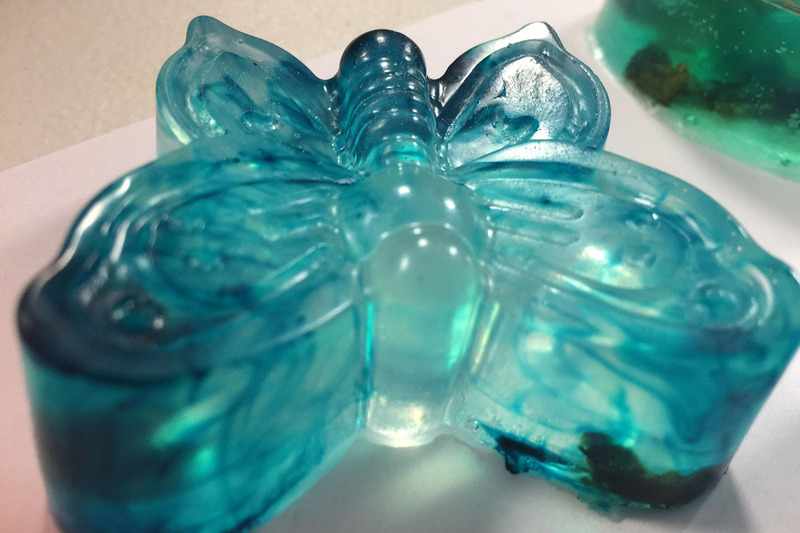 Some additional badges the Creativity Shell offers for scouts are: Soap making, basket weaving, candle making, glass fusing, jewelry making, pottery, drone building/making and more! Please contact us to register your troop today! 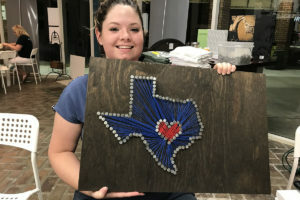 STRING ART – String art workshops are an excellent way to create with wood and strings. Students in these workshops can create a variety of different artistic items such as maps, animals, names, letters and art. String Art also builds on hand strength as hammering nails into wood is necessary to make these projects successful. MINI MAKERS MARKET AKA (THE MUNCHKIN MARKET) – The Creativity Shell’s Munchkin Market gives students the opportunity to learn social, business, math and entrepreneurship skills. 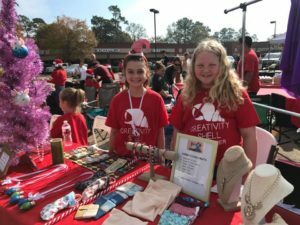 All items made and sold in the Munchkin Market are made exclusively by K-12 students. Students can keep the money they make from the market or can donate it back to an organization or cause of their choice. CREATIVITY ROCKS FASHION SHOW! 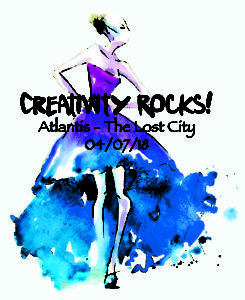 – One of the biggest Creativity Shell events of the year is our organization’s annual fashion show Creativity Rocks! The creative nature of our fashion show gives students the opportunity to artistically express themselves through dyeing fabrics, working with artistic themes, blending textiles and making unique items. The excitement of the students to finish and model their garments fulfilled the mission of the Creativity Shell by educating and inspiring the next generation of makers! 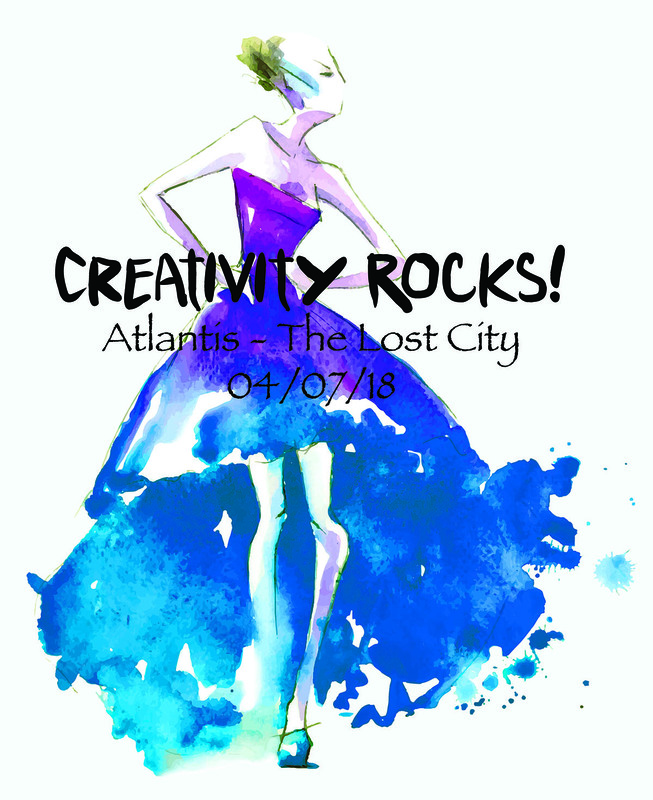 The next Creativity Rocks will be Saturday, April 07, 2018! All students enrolled in our programs throughout the 2017 – 2018 school year will have the opportunity to participate in the event. 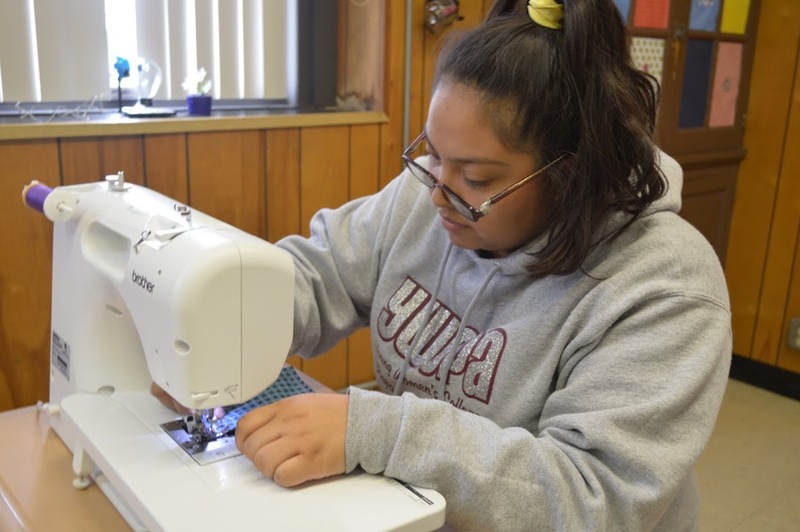 PHILANTHROPY – As we teach our students to sew, we are also teaching them to give back to the community with organizations such as Project Linus. 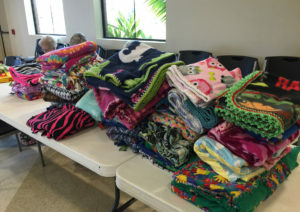 Project Linus is a fantastic organization that makes blankets to provide love, a sense of security, warmth and comfort to children who are seriously ill, traumatized, or otherwise in need. The blankets will be handmade by children enrolled in our free sewing/textile arts classes in Houston and will be donated to needy children nationwide. As our organization continues to grow, we plan to partner with homeless and animal rescue shelters to have our students make things to donate to their organizations. 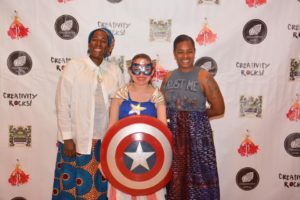 HOMELESSNESS & HUMAN TRAFFICKING – The Creativity Shell teaches vocational fashion programs to students rescued from human trafficking and homelessness in Houston. 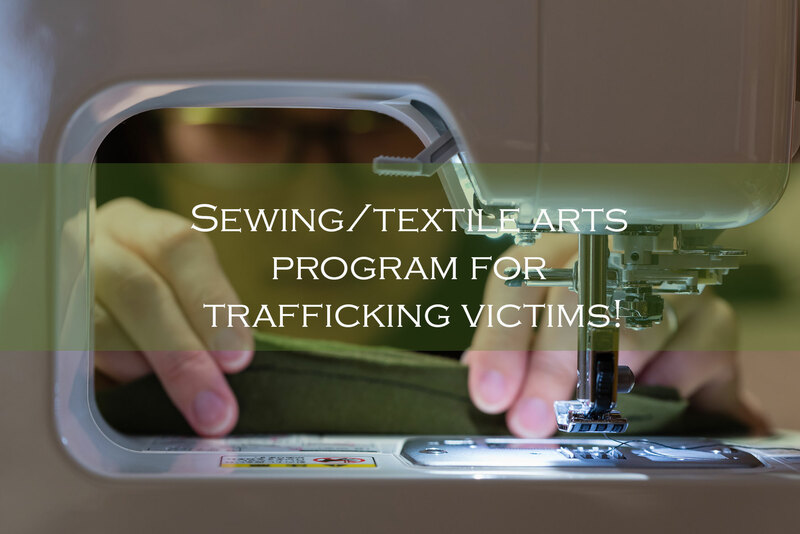 Vocational fashion programs are designed to teach practical skills to trafficking victims and help them heal at the same time. Structured programs empower the students to accomplish positive tasks while working in a creative environment with designers and artists alike. Some of the classes offered in the vocational fashion program include: fabric dyeing, textile arts, fashion merchandising, up cycling, alterations, tailoring and more. 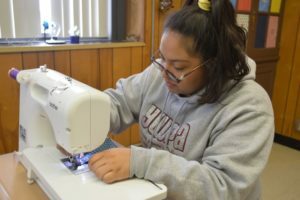 Upon completion of the vocational fashion program, students will have the basic skills to find employment in retail stores, manufacturing or entrepreneurship by owning a home based alterations business, online stores such as ETSY.com. Students are also encouraged to use sewing/textile arts skills as a hobby. SEWING MACHINE DONATIONS – From time to time we receive sewing machine donations. Some of the machines are used in our programs, (Hint Hint, we are in dire need of an embroidery machine) and many of our machines are donated to the students in our classes who excel in our programs and do not have machines at home. We are also working on a project that will give new sewing machines to our victims of homelessness and human trafficking in which they can use to continue their sewing/textile arts work upon leaving the shelter we taught them in. Please contact sdaniel@creativityshell.org if you have a machine you would like to donate.